Bholu 16 forms part of larger community development program planned by Manav Sadhna around the Kiran Community Centre. Bholu 16 is considered to be a core component of this community outreach program. The new Bholu 16 school has relocated 40 children and 2 teachers in a bright and airy new nurturing learning environment from a previous small space which was inadequate having no natural light, ventilation, sanitation or waste facilities, and having dilapidated building conditions. The site for Bholu 15 is situated within Manav Sadhna’s Mosal Women’s Centre, which supports many of the Bholu 15 mothers who work as rag pickers. 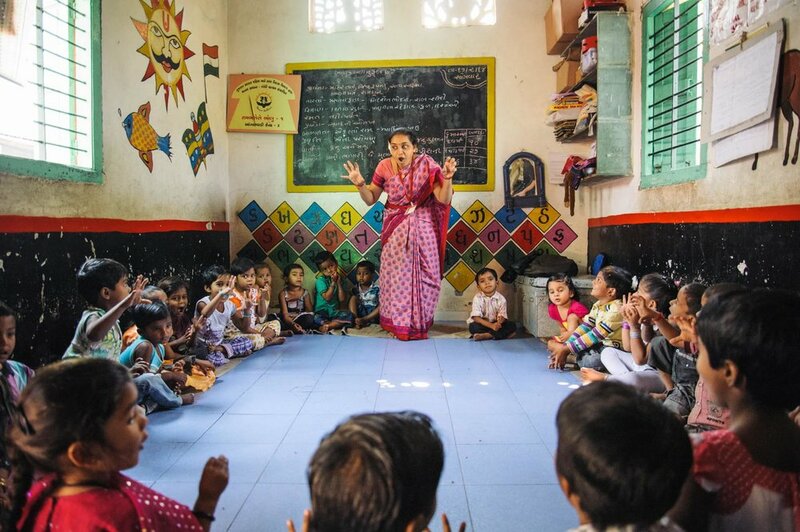 The design of Bholu 15 aims to connect with the centre to provide flexible spaces that can expand and contract as required by the community whilst providing a safe and beautiful environment for children to learn in. With a compact site, the biggest design challenge was ensuring adequate light and ventilation entered into the space. Bholu 13 features a ‘floating’ roof as a means of responding to the hot, dry climate by aiding with passive ventilation and allowing views of the trees. The design of the space was planned simply with amenities to the back and one large teaching space addressing the laneway. The internal floor and wall finishes feature recycled stone, tiles, fabric, artwork and perforated metal, which add colour and a richness of detail to the small building. Bholu 12 is located within the heart of the community and was designed as part of a temple complex and community space. It was designed to take advantage of two established trees that provide shade to the anganwadi and which provide a community hub. As the school was to fit within a solid building complex, colour was a key element in the finishing to create a lively and joyful environment. One of the defining features of Bholu 10 is the front gate of the anganwadi. Made from recycled plastic bottle tops, which are woven onto a steel mesh as part of the door frame, it provides a beautiful coloured screen between the outdoor and classroom space. The exterior walls of the amenities block were built by volunteers, with the columns made from recycled drink bottles filled with scrap paper. The children of the community were instrumental in working with the volunteers to make these beautiful and unique columns that create light and interest at the entry to the anganwadi. The design of Bholu 9 cleverly uses the small site to create a series of spaces, from the entry seat and screened entry, to the bright classroom and courtyard beyond. Passive thermal design was employed through the use of a high level brick screen and cross-ventilation through the classroom. 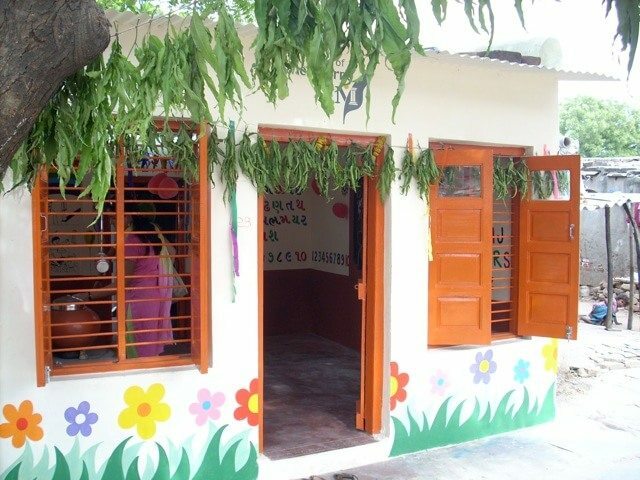 The success of this project lay within the community involvement, instigated by the volunteers and evident in the community contribution to decorative elements around the building, such as the tiled entry seat artwork, chai cup screen using cups donated by the local women and participation in the painting of the school and garden elements by the community. Bholu 8 is a great example of TAP’s volunteers implementing the ‘Reuse, Reduce, Recycle’ mantra, with a design that incorporates bright colour, an outdoor stage and an imaginative playground made from waste tyres. Colourful woven screens mark the entry at the front. Inspired by the ‘katlo’ day beds used by the locals, they were created by a local community weaver. Playful murals on the walls were created by the community and a spacious fenced playground and garden at the rear of the site were included for the children to play in. Bholu 7 is located within the courtyard of a house of an owner who offered the site. The large site for the school allowed for the design to be focused on its relationship to the garden and water collection while creating a peaceful learning environment. An emphasis on external play and engagement with nature was instigated through external seating areas; a stone bench surrounding the central tree in the courtyard provided a seat in the shade, while a second bench along the school wall has become a popular lunch place for the children to enjoy the outdoors. The overall planning of Bholu 6 anganwadi incorporates a generous classroom with the external courtyard housing washing and toilet facilities. After several years in the harsh slum environment, and dilapidation of the old roof, the school had become unusable and was in need of a major renovation. The renovation included raising the roof height to build in clerestory windows for light and ventilation, durable waste stone flooring, new roofing and insulating panels to the ceiling and increased privacy to the courtyard spaces by raising the wall heights and adding screens. Bholu 5 is a wonderful example of how simple and clever design interventions can make great changes in the children’s learning space. The outdoor area and wash area was extended and improved to give the children more space and high level ventilation grilles. Recycled decorative windows and fans were incorporated to create an airy and light-filled room. Due to the quiet nature of the site, the class is sometimes conducted outside under the shade of these trees, allowing a connection to nature. Bholu 3 was built on land that was generously donated by an elderly local resident, Mano-ma, who wanted to assist the children of Manav Sadhna as she has no family of her own. A compact space, the building is cleverly oriented to the site, so the school looks out to a large existing shade tree and the classroom allows light and breezes to flow through. 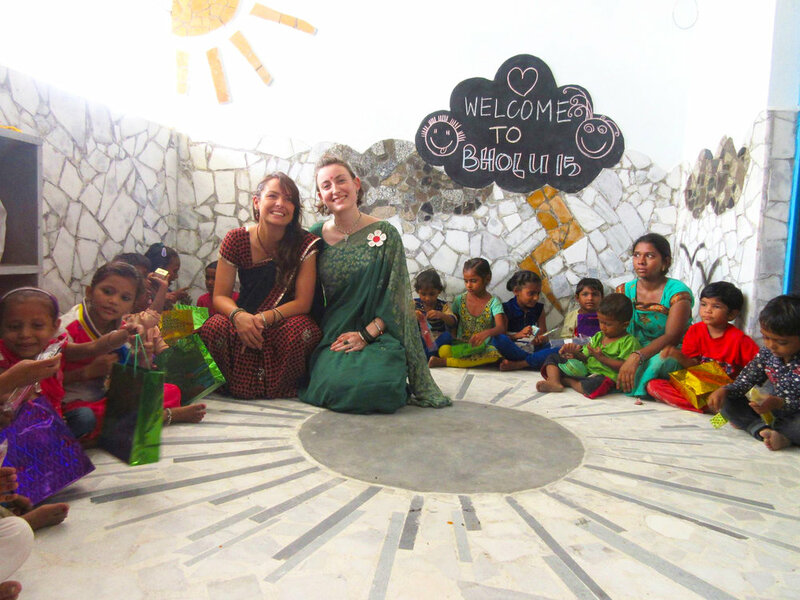 The Bholu 3 design also incorporates a beautiful veranda space and outdoor wash area, all decorated by local artisans and the children. 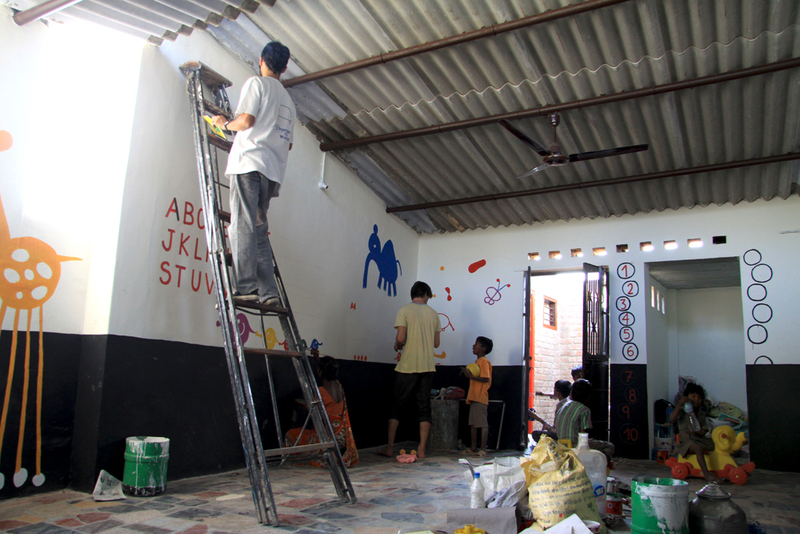 Bholu 2 was the first pre-school which was completed in collaboration with Architects Without Frontiers, Australia. The inconspicuous school space is tucked behind houses with a narrow address to the street, with a small stair and shoe store upon entry. Once inside, the classroom is expansive and light, being raised above the street level. Due to its generous size, this has allowed for an increased intake of children from the surrounding area.